Chanderi Tiramisu is a boutique in Anand Lok run by Shakun, a designer who creates beautiful outfits from the basement of her home. From weddingwear to comfortable dresses, they're doing everything at this little boutique studio. Customised summer dresses, saris, shararas, lehengas and more ethnic wear. Shakun does everything from turning old saris into lehengas, shararas or comfortable linen co-ords. Though you can order her stuff online (and she's nice enough to get everything customised as per your size), we recommend visiting her boutique in person if you can. You can check out her breezy kurtas, pre-stitched blouses, lehengas, saris, shararas and all the different fusion combinations she's come up with for ethnicwear. If you have a particular design in mind and you'd like her to recreate it, she can do that too. 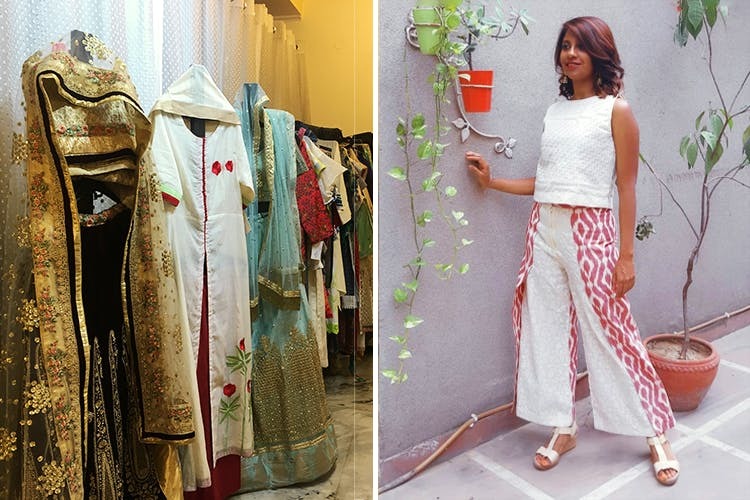 It's not your typical master-ji's boutique, so explore her basement for Tussar silk jackets, box-pleated trousers, colourful linen dresses, cold-shoulder tops and more. She's got a nice mix of Indian and Western outfits that can be customised according to size, colour preferences, fabric and more. You can also see her look-books to get an idea of the kind of stuff she can do for you. Her tops start at INR 900, lehengas from INR 6,000 and her dresses from INR 1,800. Her turnaround time isn't bad, but we wish it was a smidge faster.